Peace and order is essential for development and economic growth of the state- Pema Khandu, CM, Arunachal Pradesh. Chief Minister Pema Khandu said that peace and order is essential for development and economic growth of the state. Addressing the 25th annual conference of Director General of Police/Inspector General of Police and heads of central police organisation of North East region here at Dorjee Khandu State Convention Centre today, Khandu said security and development has to go together and without state police being efficient such goals cannot be achieved. He commended the role of police and security forces in maintaining law and order in the state and in North East. He said security situation in the region has considerably improved due to fresh development impetus given by the centre. The Chief Minister applauded the role of centre in improving the presence of North East people in central paramilitary forces and in Delhi police. He encouraged youths from Northeast to join these forces and urged the police organisations to carry out awareness programme in this regard. He further said North East must be looked on as one entity when dealing with security matter. He also said Assam Police has pivotal role to play in security of the region as the state shares borders with almost all the states in North East. He said though Arunachal has no home grown insurgency but the three eastern districts of the state is affected by it. He enthused confidence on the Police, Para military forces and Army that the matter would be efficiently tackled. 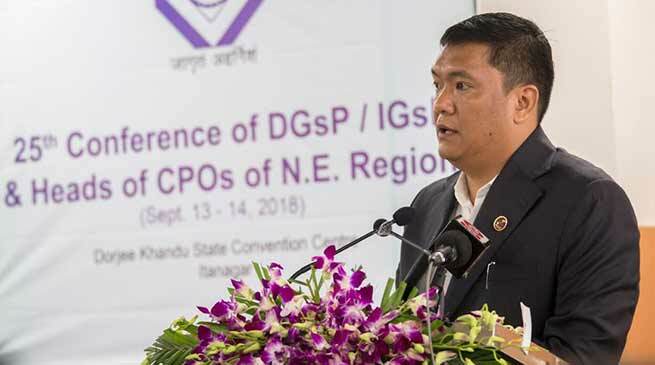 Khandu further stressed on strengthening information sharing mechanism, follow up actions and coordination between different state police so that security apparatus is improved. Earlier Union Minister of State for Home Affairs speaking on the occasion said police officer must exercise calmness, refrain from profanity and exercise empathy even in tense situations. He said people have expectations on police so they tend to be more demanding and abusive towards the police. He also said police can play positive role in promotion of tourism by conducting themselves in decent and helpful way.